We will coordinate all of your reception events with you, your caterer, photographer and videographer, no need to worry! Your reception will be customized by you. We send each bride and groom a detailed questionaire and songlist which lets us know exactly the types of music you want during dinner, your first dance song, choice for the father and daughter dance, who will be giving the toast, etc. For dinner music you may be looking for a truly elegant reception. You may choose Classical Baroque, or if you would like a contemporary flair you may choose a mix of contemporary and traditional jazz, or a mix of country and oldies. While every Bride and Groom are different, so is every reception, that's why we pride ourselves in finding out what YOU want for your special day. Our music selection is huge! We bring our entire collection with us to each event so we are always ready for last minute changes and special requests. We try to make every reception fun and memorable for everyone and can include fun songs like the Y.M.C.A, the Cotton-Eyed Joe, and the Chicken Dance to get the party going. We add new music to our collection monthly and are always ready with the latest dance hits, while at the same time having that special song for an older relatives special request. Our selections range from the Big Band era all the way to today's top 40. We would love to provide our services for your wedding reception, be sure and book early - a year in advance is not too soon and Saturday evenings book especially fast. We are not a DJ booking agency, therefore our availability is limited. Once we're booked, we're booked. 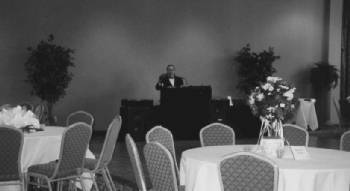 If your wedding ceremony and reception will be at the same location (indoors or out) we can provide music for the ceremony also! Ask us for more information!